It's interesting how life weaves it's web with the aid of synchronicity. This is what I mean. I had decided to publish the following coincidence example, but then thought that it wasn't really sufficient for a full post. "While watching television, I heard an unfamiliar noise, which turned out to be my car alarm. I found no obvious reason, but I suddenly saw a butterfly fluttering around inside the car. What film had I set up to record that evening? The Butterfly Effect!" I therefore decided to search on Google the words 'butterfly coincidence'. 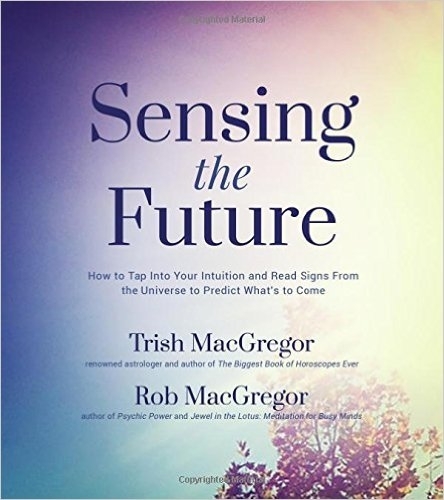 This led me to a September 2013 post by Mary DeTurris Poust with the title of Convergence, coincidence, and cosmic connections. In the post she writes: "... I was talking with a priest I know about some issues I needed to grapple with on retreat, he made a comment about being like a butterfly, and I responded: "I’m so not a butterfly; I’m more of a dragonfly." And that was that, a comment made in jest without much thought." Shortly afterwards Mary was looking for a religious icon, "... but instead I found a notecard from a dear - and very holy - woman who died more than a year ago. It had a beautiful watercolour dragonfly painted on the front of it." She reached the retreat centre, "... and within 30 seconds a giant dragonfly landed in the grass right in front of me. A few minutes later, another one zoomed by. As I went to my car later that evening to get something, a dragonfly buzzed right in front of me in the parking lot. And I smiled every time." Finally she tells how she was sitting at her favourite prayer spot having a deep, heart-to-heart silent conversation with God. She writes, "I reached a point of peace, an interior place where I posed a question, accepted that I had to let it go, and then asked God to please take care of it. And within five seconds a dragonfly landed on the dock right next to my chair. It was the only one I saw that day, but it showed up at the exact right time." I decided then to visit Mary's home page, it's an interesting blog by the way. This was on the 26th of August, and her post for that day, What are you chasing? ", just happens to have an image of a butterfly for illustration purposes. I thought that would be an adequate ending for this post, but there's one more synchro. 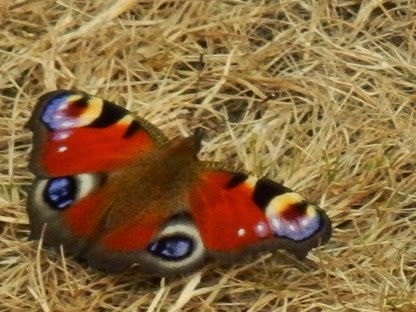 As I finished writing a butterfly came and sat on the windowsill of my office. This got me thinking about some of the posts on this blog where butterflies have paid their part. Some people believe they may be messengers from deceased loved ones, or perhaps some sort of sign. There's meaning in those butterflies. And, I guess, in dragonflies too! I was about to write the same thing that Shadow did... This post is fascinating! 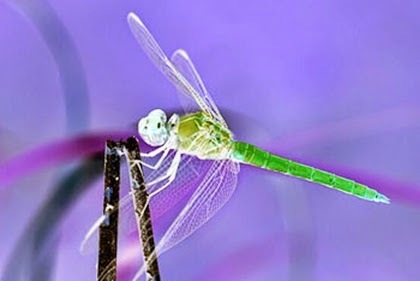 There is so much beauty in winged creatures--butterflies, dragonflies, birds! All are difficult to capture well for an amateur photographer such as myself. However, without a camera, it is easy to watch them for long periods of time and not miss a thing! Having just visited a botanical garden, I noticed that the butterflies were flitting from one blossom to another, but the dragonflies all sat still on the lily pads. I wonder if that means anything! At any rate, this is a delightful post! I once had dream that a friend of mine's wife caught a blue butterfly in a net (I had been reading Proof of Heaven at time, which has a blue butterfly on cover). A few days later a different friend posted a picture of a blue butterfly in a net (she had caught it in her house). And she had been painting a butterfly at the time. I think the butterfly represents change (metamorphosis). In my case, the butterfly represented my own transformation at the time, which was being stymied (caught in the net).